ARE YOU AN WANTING TO MAKE POSITIVE CHANGES IN YOUR COMMUNITY LOCALLY AND WORLDWIDE, MAKE NEW FRIENDS, CONNECT PROFESSIONALLY? Rotary is a volunteer organization with approximately 1.3 million members in approximately 32,000 clubs around the world. 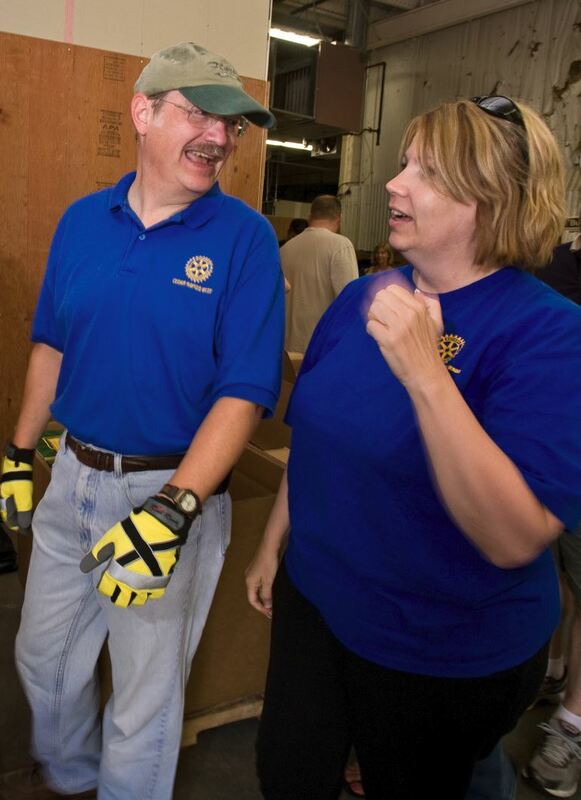 The object of Rotary is to encourage and foster the ideal of service as a basis of worthy enterprise. If you want to meet a group of positive business and professional people who are interested in making Victoria and the world a better place, then come for a visit. We have a variety of charities and projects that we support both financially and with our efforts. The more you get involved, the more you get out of it. You will grow personally and develop many new, diverse and interesting friends while we work together to make the world a better place. Who is in your club? With about 90 members, our club contains a broad range of businesses and professions. We have current and past CEOs and executives of many well known organizations. As well, we include small business owners, professionals and managers. We meet every Wednesday morning (except holidays) at 7am at the Union Club near the Empress Hotel. Meetings usually wrap up just past 8am. A full breakfast is served and your first breakfast is free. The rest of the time, breakfast is $17. If you are not a morning person, please check out other clubs in Victoria that meet for lunch or in the evening. There is a monthly Rotary membership fee of $27 plus breakfast costs. On an annual basis, you can expect the cost to be close to $1000 if you chose to be part of the social events or donation activities in which many members participate. We participate in many service projects in Victoria and the international community. Please go to the photo journals on the home page - right side for "Our community Projects" and "Our International projects" - to view a selection of projects we are or have been involved in. You should attend at least 50% of our meetings or participate in a make-up. In order to get the most out of the 'fellowship', we encourage members to attend the meetings. It is a good idea to come along to a few meetings and meet some of our members and if Rotary would be a good fit for you. Should you decide to join, please complete the membership form online. A past-president will meet with you to answer any questions you may have, and to ensure you understand the obligations of membership. Subsequently, the board will approve your application and once approved, you will be inducted into the club at one of our weekly meetings. One thing you will notice immediately is the welcoming atmosphere at Harbourside Rotary. The pre-meeting coffee is lively and a great opportunity to get to know some of your fellow Rotarians. This is an opportunity to mingle with community and business leaders. We are a mixture of young and older members from diverse backgrounds - a invigorating group with many community connections. After breakfast, there are updates on the projects we are involved with, a topical speaker along with a host of other varied activities. The meeting ends by 8:15, which enables members to make their way to work - or for others to meet for a coffee.